At PEPY, one of our philosophies is to ‘be strategic in our choices, and thoughtful in our plans’. From time to time, our strategic choice results in a transition out of projects for a range of reasons, and when this happens, the sustainable future of those programs is taken seriously. As we enter the 2013/14 school year some big opportunities and expansion areas are coming our way. Our vision is “every young Cambodian empowered to achieve their dreams”. We’ve thought long and hard about how we wish to grow and improve, and achieve this vision. At the heart of this we have been talking to the community we work with to see where the real need for our support is; what is their dream? In Kralanh district, students and their families have told us that gaining access to jobs is their dream, and for that, higher education is paramount. Therefore, PEPY’s approach is developing to support more high school and university students to ensure the best career opportunities possible, and we’re all really excited about this! As a result, PEPY and our stakeholders have decided to hand over some of the projects that no longer match this new direction to new leaders within their community. In July 2013 our Programs team held a handover workshop to share the results of the work that PEPY has been delivering within the Kralanh community over the past several years, and pass on the ownership of this work. We got together with more than forty crucial stakeholders: village leaders, school support committees, teachers, a commune councillor, and representatives from the Young Leader Project and the passionate bunch at Volunteer for Community Development. Sakhakum Aphiwat Sala means ‘Communities Developing Schools’. This project works with School Support Committees (similar to Parent/Teacher Associations) fulfilling their responsibilities as per the Government’s Education Policy, and also developing their school in the way they feel is right for the needs of their community. The SAS model is time bound in design and normally runs in 3-5 year cycles, therefore after three years of supporting Chanleas Dai primary school we felt this was a good time to end this work. PEPY will continue to support the School Support Committees twice in the first year after transition to support any capacity building challenges. PEPY’s Child Clubs work to help students make a difference in their own community. The goal of this program is for children to identify, share, and communicate solutions to their own problems. Subjects studied include prevention and treatment of Dengue Fever and Malaria, personal hygiene and road safety. After 5 years of project delivery, many children in Chanleas Dai have participated in the clubs. They are familiar with the process of identifying issues within their community and working together to solve them. Some of the young people participating in the Young Leader Project are very motivated to run clubs for young people themselves; we’re delighted and think this proves the success of this initiative. To ensure the success of this transition, PEPY has spent several weeks shadowing the youths leading this project for themselves. In Young Leader Clubs, students are given the opportunity to learn and talk about subjects they may not learn, or hear about, in any other environments. Some of the topics include financial management, time management, interpersonal relationships, and reproductive health. Many young people of this age (over 15) are migrating to Thailand for work, and cannot attend the clubs. For those who are not migrating to Thailand and are involved in club activities, the young people are so actively engaged that the clubs are almost now running themselves. We feel that a more responsive approach would be to support the development of these independent initiatives, and try and ensure they become role models for other communities, rather than to continue having a direct involvement. Like Child Clubs, to ensure the success of this transition, PEPY has spent several weeks providing a handover period with opportunities to overcome any challenges of the young people taking this forward, through training. TTS project offers training and support for Cambodian Government school teachers in English language learning and teaching of English. 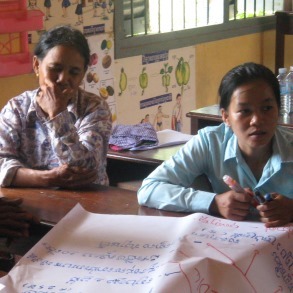 Fifth and six grade government teachers have access to training for two hours per week, at these support sessions Seng (PEPY’s teacher trainer) encourages teachers to share the challenges and successes they’ve encountered in their lessons. 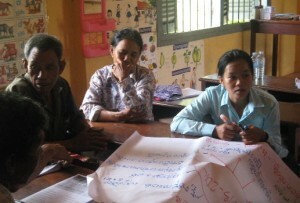 Seng also gives advice on participatory teaching techniques and lesson planning and gives English language lessons to the teachers. TTS was designed to run as a 3-4 year project, which has now come to its end. We also believe that our strength lies in working with young people. Like SAS, while we value that TTS indirectly supports the development of students, we foresee a bigger change if we work more directly with these young people. PEPY will continue to support teachers two times a year for one year following transition to build capacity. PEPY are proud to have been acknowledged by the commune representative who praised PEPY projects for strengthening teachers’ capacity and that students have demonstrated improved communication skills and built confidence. We’re delighted that students from the Young Leader Project have expressed a great deal of commitment to taking this project forward, and they’ll do this by implementing an activities plan developed in partnership with PEPY. We’re really happy to announce the expansion and development of the following projects that we’ll be focusing on from September 2013. Dream Management Project will be working with grade 12 students from Kralanh high school to provide career advice. PEPY will deliver an annual skills’ fair, provide weekly Dream Classes, coordinate scholarship opportunities and engage students with prospective employers through business visits. Scholarship Project will provide 20 scholarship opportunities to Kralanh High School graduates per year (2013, 2014, 2015) to help fund further education at university or vocational training institutes in Siem Reap. PEPY will support school fee, living costs, health care, transportation, and study supplies. Youth Empowerment will work with students to gain soft skills and improve their employability. PEPY will provide English support, ICT classes, soft skills (such as leadership or entrepreneurship), mentorship and facilitate career forums. For more information on our five year strategy, please watch this video about our exciting plans! Lego lovers school vacation fun!